Putting the Odd In Todd: Look, I mention Excite Bike! Look, I mention Excite Bike! Last Febuary, Camerin and I got the opportunity to do a talk at a local church about our dating book. I diligently prepared for it. We met and read through our scripts together. I memorized and memorized. And it went pretty well. On Sunday evening, we did another singles event. But for this one, I stayed up the entire night before riding my bike through downtown Chicago in the annual L.A.T.E. Ride. I think I learned from this experience that anytime I need to do public speaking, I should stay up the entire night before and cram for it--because I think the talk went better this time. Oh, and I think I may develop a video game based upon my experience with the L.A.T.E. Ride this year. The idea is to manuever your bike through a crowded pack of bikers while avoding obstacles like skinny snotty blondes who really want to cross the street despite the thousands of bicyclists, full water bottles strewn throughout the street, guys doing kareoke, and vomiting party girls jumping out on either side of the street. It'd be more fun than Excite Bike! PTOIT SPECIAL FEATURE: FUN WITH GOOGLE! Today's Search Terms: "Library" and "Safari"
Photo #1: Now, this is a Safari Library. When I look at this picture, two thoughts run through my mind. The first is of a lion rampaging through this cozy little set-up and a librarian asking him for a library card. 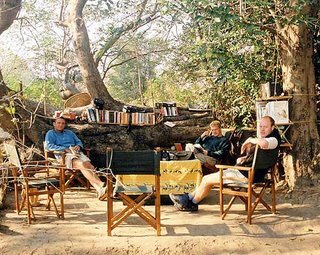 The second thought I have is that all those books have titles like How to Find Women in the Jungle, How to Decorate your Safari Pad to Attract Women, and Lonely in the Jungle? 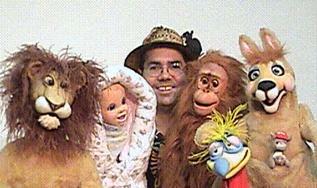 Photo #2: Why is it that the creepiest puppet of them all is the little girl one? Hmmm, or is it the one in the middle? Phot0 #3: Ernest Hemingway. This photo is included here for Gene. Gene is my old roommate (as in former roommate, not that he's my current roommate who is very aged). 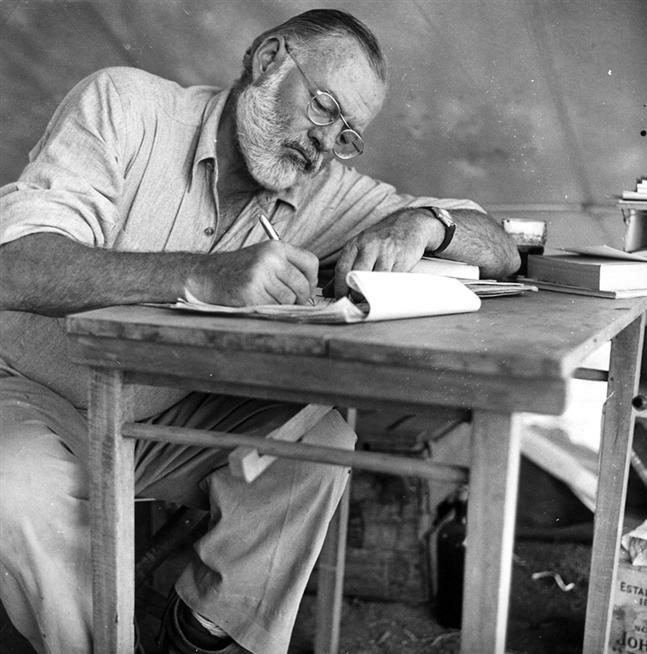 Gene is the only person I know who would dress up at Halloween as Ernest Hemingway. Or cook from a Hemingway cookbook. And I'm serious. He did. Luckily we never got the recipe for lion. 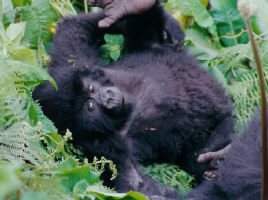 Photo #4: Gorilla! Is there any search that doesn't bring up monkeys? Contrary to popular belief, and by popular belief I mean Todd's belief, getting your picture with a giant dog is not all that difficult. Slightly OT... but odd nonetheless. I haven't checked the feedback on your book on Amazon until today. I particularly enjoyed Steve's insightful comment. (I was only 1 of 2 who found it helpful). His rant covers the gambit... angry bitter divorcees with kids, vasectomies, biological clocks, and his personal failures at internet dating. I also enjoy how this is Steve's only review on all of Amazon. Tip of the Decade: Check under your car as you head out into the parking lot. Slightly OT? Old Testament? Is this IM language that I am not hip enough to understand? we used to tackle people in mascot costumes in malls. we found out that most people who put on those costumes are college kids or old retired guys. I'll review myself when I need to. Second verse, same as the first! Ok, maybe not, but hopefully this time my comment will show up. First of all - Excite Bike was my favorite Nintendo game. Build your own tracks and then watch the guy tumble over and over and over and over down the hills and off the side of the track. Enough already! Now, about those pictures. I'm pretty sure there's a woman involved with the decorating of that camp site in the first pic. They're using a table cloth! That second pic has to be one of the scariest images ever taken. I feel sorry for those children who get tortured at their birthday parties with those creatures. There's the bulimic lion, the alien baby, crazy kangaroo with the australian lizard in it's pouch, and the thing. ALL of them looked completly stoned and that creature in the bottom right also has the additional look of being drunk and wasted. The last pic is my favorite. 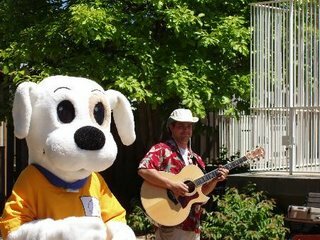 I like how they brought along the giant white-bar cage to capture the giant-headed dog. Ok So I jast want to say it. Are the Tigers for real? They just won a series from the sox? I never really know what "for real" means. That bugged me last year too when people asked it about the White Sox. I guess it means, "Are they Contenders or Pretenders?" And I think we've known for a while the Tigers are of course regular season contenders (whenever you are in first in June, you are a legitimate contender). Are they a great ballteam this year? Yes. Will they make the playoffs? Yah. Will they do well in the playoffs? That, as I've said for a while, I still don't believe in. But for now, are they just gonna stop winning? Nope. But is the season over for us? Nope. Two games a season does not make. (Especially when that's just 3 of 9 they've won). But is all rosey in ChiSox land? No. But it's not the Tigers I am afraid of. It's the Chicago White Sox. While the Tigers are playing above themselves (like we did last year), the Sox are way underperforming. Hey, I posted awhile back about the one angry man writing the Amazon review for your book. Also, alls ah sez was that I was going to step onto the ledge, not jump off it. Knowing that at least they're not the Cubs is not enough for me anymore.